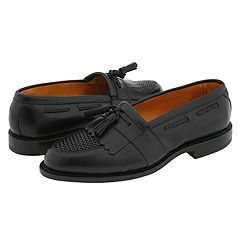 Here is a great alternative to your traditional oxfords. Try the Cody Shoe by designer Allen-Edmonds. These classy leather slip-ons have braided laces with tasseled endings for a nice comfortable fit. The Cody Shoe starts around $300. Available in black and chili.